Is there anything better than a romantic vacation away to rekindle your love for each other or for yourself? We think not. But if you're thinking about your bank account and how much it will cost you to save for a flight to Italy, don't stress, because there are just as many beautiful locations in the U.S. for you to visit instead. According to luxury travel experts Zapwater, there are some stellar U.S. vacation spots for couples so we asked them to list out their top 15 along with where to stay and what to do while you're there. Get ready for an intimate night in, scatter the rose petals, and watch sensational sunsets at the incredible oceanfront oasis, The Georgian Hotel in Santa Monica. Visitors can sip tea amidst the beautiful Southern California sunshine, the sounds and sights of the Pacific while enjoying High Tea on The Veranda Terrace. Patrons can savor in this tradition redefined with a vast selection of teas as well as a classic Highball cocktails, sparkling champagne, savory treats, petite pastries, and decadent caviar canapés. Undergoing a renaissance, Asbury Park has transformed itself into the cultural hub of the Jersey Shore with a legendary live music scene home to Bruce Springsteen, a burgeoning restaurant destination and vibrant surf culture. Couples can stay at The Asbury Hotel, whose design is a mash up of Victorian-era history and rock-n-roll present. You and your partner can experience the Baronet rooftop movie theater for getting cozy; Salvation rooftop cocktail lounge for a nightcap and views of the Atlantic; Soundbooth which features a massive wall filled with vintage vinyl LPs and cassettes; bowling at Asbury Lanes, the iconic 1960's bowling alley-turned music venue; and the pool, which is a romantic sanctuary for guests with a fireplace and swinging lounge seats. Nestled in the stunning red rocks of Sedona's Boynton Canyon, Enchantment Resort is a dream-like destination for couples. In addition to fine dining options, cozy fire pits and romantic activities such as star-gazing tours and Aura-Soma Relationship Readings at top-rated Mii Amo Spa, Enchantment Resort offers the ultimate couples-escape with their "Suite Romance" package. Couples can enjoy the luxury of their own Casita junior suite with a private fireplace and patio, full breakfast each morning and nightly dinner for two at any restaurant or in-room dining, and a romantic amenity upon arrival. Rekindle the romance with your significant other in Newport, Rhode Island where couples can fall in love with this historic city by the sea. With charming accommodations, sumptuous culinary options, picturesque strolls and breathtaking sunsets, Newport is the ideal destination for those seeking culture with a side of romance. The Chanler at Cliff Walk provides guests with ocean view rooms equipped with fireplaces for the ultimate cozy experience. Climb aboard Sloop Eleanor to enjoy a private sunset sail and snuggle up to your honey with catered bites by Sweet Berry Farm. Or, stay on land to enjoy the ultimate romantic dinner at The Chanler's onsite restaurant, Cara where couples will be greeted with a dozen roses and can indulge in personally crafted menus by candlelight. Further up the coast, couples can escape to the Central Coast for an intimate getaway at Oceanpoint Ranch, which sits adjacent to the majestic shores of Moonstone Beach. Guests can build their own picnic with a complimentary picnic basket, blanket, a rich bottle of wine, charcuterie, and s’mores for a romantic evening on the lush hillsides of Cambria or decide to indulge in contemporary American cuisine at The Canteen, the hotel’s restaurant on property. Local diversions include, a tour of the renowned Hearst Castle or wine tastings at the bountiful wineries in Paso Robles Wine Country. Where the emerald-green landscapes meet the sea, patrons can dip their toes in the soft sands in San Simeon while listening to crash of the waves upon the shore and observe the Elephant Seals as they prepare to spend time on land. Retreat down South for a relaxing getaway at Sea Island, a Forbes Five Star resort on the coast of Georgia, where couples can indulge in private picnics, wine tastings, horseback riding along the beach, rose-petal baths, kayaking at sunrise, and some well-deserved R&R. Book accommodations at the hideaway, The Lodge at Sea Island, where romance and luxury go hand-in-hand. Resembling a traditional English manor, the sophisticated property offers picturesque ocean and golf course views as well as 24/7 private butler service. Couples can book the Romance Package and receive: luxury accommodations; complimentary suite upgrade upon arrival, if available; bottle of sparkling wine upon arrival; room service breakfast daily; one $200 dinner credit toward the Sea Island venue of choice; a couple’s massage for two in the Together Suite at The Spa at Sea Island; and a rose petal turndown, too. 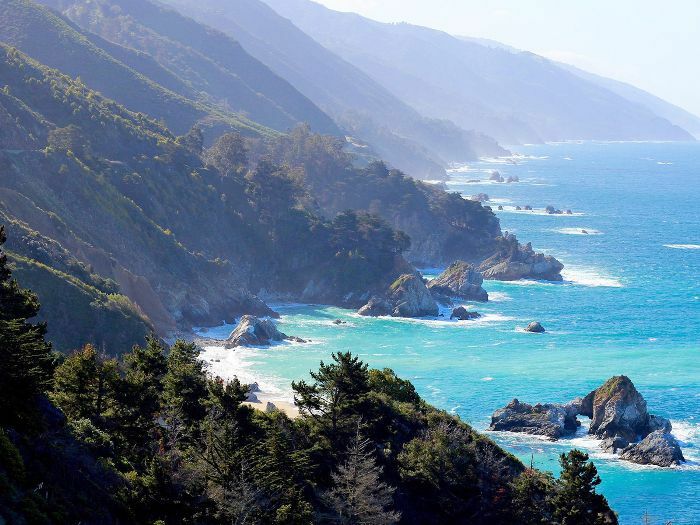 Big Sur is one of the unique jewels of California, offering endless ocean views, beautiful state parks and beaches, and a level of seclusion perfect for a romantic getaway. Couples can see the iconic Bixby Creek Bridge, take the 17-mile drive for scenic views, or hike to McWay Falls to see an eighty-foot waterfall. Glen Oaks, which has been dubbed one of the world’s most romantic hotels, is one of the many great places for couples to stay in Big Sur. Another romantic destination is Post Ranch Inn, which is perched on a cliff overlooking the ocean. Finding inspiration and inner peace is easy on The Beaches of Fort Myers & Sanibel, with its miles of soft sand, shell-covered beaches, calm waters and a carefree pace of life. Southwest Florida’s barrier islands Sanibel and Captiva have a long history as a retreat for travelers looking for solitude and relaxation; with no chain restaurants, stop lights, or buildings higher than a palm tree. This, combined with the islands’ simplistic beauty, provides visitors a retreat from contemporary society that has otherwise become increasingly difficult to find. Located a short drive from NYC and Boston, the quaint city of Burlington has the cozy charm to turn any weekend into a lovers retreat. Get back to the butterflies with a stay at the modern, yet rustic Hotel Vermont. Pro tip: book a top floor king with whirlpool tub and in-room fireplace—perfect for snuggling with your S.O.! Hit the town with complimentary bikes or stroll along Lake Champlain, followed by a hands-on breadmaking class at Brot Bakery, or a local brew or cider at one of the many breweries or cider houses within walking distance of the hotel. After a day of adventure, snuggle up in Vermont Flannel robes with in-room hot toddies from the hotel's exclusive Bedtime Menu. What’s more romantic than the natural aphrodisiac of wine? Couples visiting California’s wine country can choose from over 400 wineries, take a ride on the Napa Wine Train, enjoy a romantic hot air balloon ride overlooking the vineyards, take a cooking class, get a couples massage at the many spas, or enjoy world-class food from some of California’s top restaurants. Indian Springs, which is an Olympic-sized pool filled with thermal geyser water, makes for a more ‘off the beaten path’ Napa activity. For the ultimate secluded stay, Calistoga Ranch is the perfect spot for couples. Visitors can rent their own charming lodge straight out of a fairytale, which includes an outdoor bath and shower, fire pit, and some even include a private jacuzzi for couples to relax and enjoy the nature views surrounding them. Forego the outrageous resorts and escape to Manchester, VT for an idyllic, adventurous vacation at Kimpton Taconic. Nestled in the heart of the Green and Taconic Mountain ranges, Manchester is the perfect getaway to connect with your loved one while immersing yourself in nature. As an under the radar destination, Manchester gives a new meaning to local experiences and encourages guests to unplug with a wealth of intimate activities for every season such as swimming in secret waterfalls, kayaking and tubing down the Battenkill River, skiing, snowshoeing, hiking Equinox Mountain (the highest peak of the Taconic range), fly fishing lessons with Orvis or off-road driving with Land Rover. Every trip to Wrangell-St. Elias National Park is unforgettable. It is located in southeast part of Alaska, and is one of the most easily accessible places to see the natural beauty that abounds in America’s largest state. Kennicott Glacier Lodge is a family-owned establishment featuring gracious hospitality, breathtaking Alaska scenery, and access to the National Park which happens to be just across the street. Try glacier hiking or ice climbing on the Root Glacier, or make your way through the historic town known for the Kennicott Copper Mine, where ghost town tours are also offered. For a spot that is truly off-the-beaten-path, many Western adventures await you and your S.O. in the unincorporated city of Gateway, Colorado. At the Gateway Canyons Resort, couples may take part in scenic horseback rides on the ranch, indulge in the onsite spa, or book an air tour over the nearby landscape. If you both would prefer a more intimate experience with your surroundings, arrange a time for hiking, mountain biking, or rock climbing at your leisure.